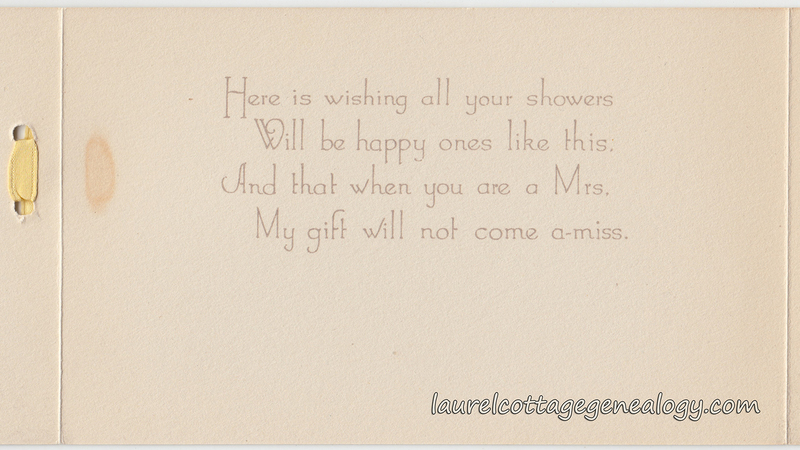 Bridal shower card, circa 1927 from The Buzza Co. The yellow ribbon attached to the card has produced some discoloration under the ribbon on the front and inside of the card. Will be happy ones like this. 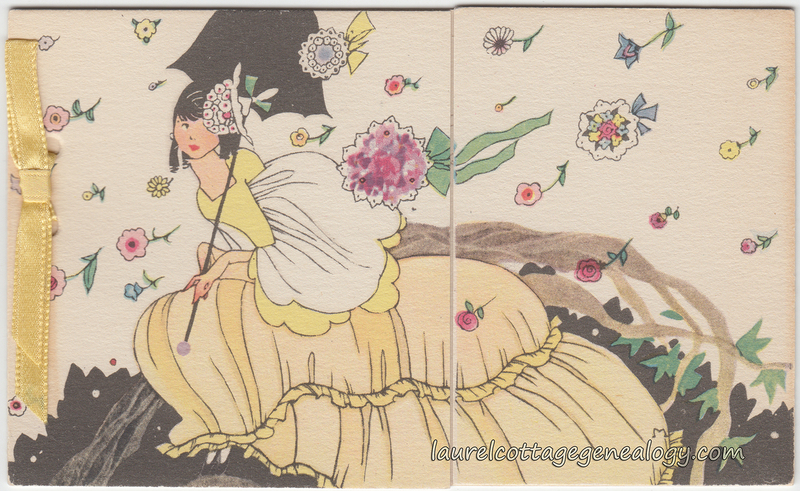 And that when you are a Mrs.
It’s raining flowers in this absolutely lovely bridal shower card showing a young dark-haired bride-to-be in a yellow and white gown, and holding a cute little black umbrella. 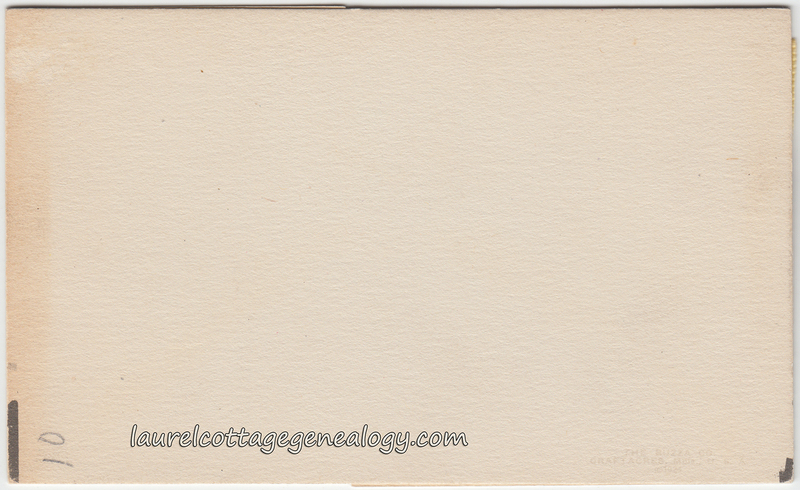 This is a Buzza Company card, and there is already a lot that’s been written about this company and it’s founder, so just a few quick facts: Buzza was George E. Buzza (1883 – 1957) who started a greeting card company that became one of the largest in the United States. The first cards came out in 1910. 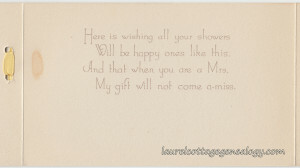 The company was known for it’s high quality and innovation, and also produced other items like bridge score cards, etiquette and children’s books, and framed sentimental sayings. 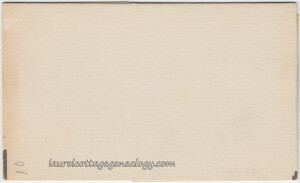 The card shown above opens almost in the center to reveal the message on the inside; the second image above was cropped so that the saying would be easier to read. 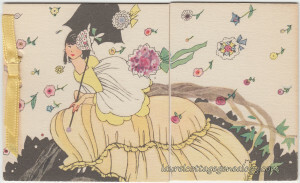 The third image shown above is, of course, the back of the card, and you would hardly recognize that there is anything there unless you look very closely. At the bottom right there is a faint imprint showing “The Buzza Co. Craftacres. Mpls. U. S. A. Copyright 1924” . Craftacres is a building name: When the company, located in Minneapolis, Minnesota, needed more space, Buzza had a new building constructed that was opened to it’s employees in May of 1927, and was named Craftacres.